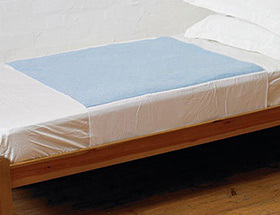 Incontinence bed pads for a worry free sleep! Kylie are a brand known for their range of unbeatable incontinence products. Available in pink or blue the Kylie Bed pads are carefully designed to ensure they look and feel exactly like sleeping on a normal bed – you won’t even notice they are there! The incontinence bed protectors are crafted from superior stay-dry materials to wick away any moisture while you sleep and boast a great waterproof backing which gives you peace of mind knowing it will remain dry and the tuck-in flaps will hold it firmly in place. The waterproof bed pads are perfect for use on your bed – enjoy a worry free sleep! Kylie bed pads use a 5 layer design that is extremely effective at keeping urine away from the skin, keeping you dry and comfortable all night, every night. Don’t be without these washable incontinence bed pads, reliable protection and there for when you need them most. You’ll wonder what you ever did without them!